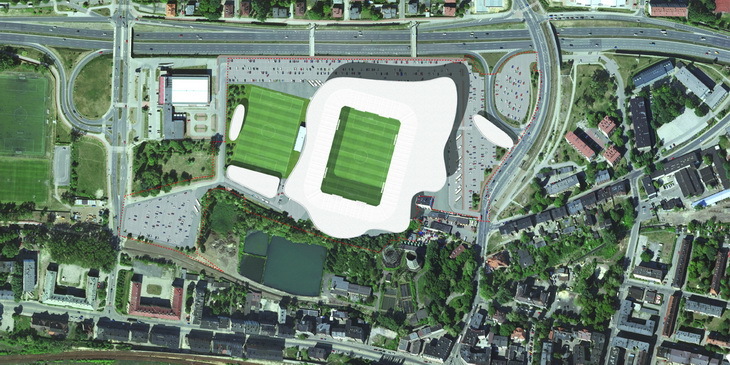 We are featuring an elaborate proposal for the project design of Ruch Chorzow Stadium in Chorzow (Poland), entry is designed by Andrea Maffei Architects. The competition involves the construction of a new stadium with a capacity of 12,000 seats, easily up-gradable to 16,000 seats. The competition involves the construction of a new stadium with a capacity of 12,000 seats, easily upgradeable to 16,000 seats. The request is to build a modern sports center, performing, and secure. The project area includes, in addition to the stadium itself, a regular-size field for training, and a real "sports village" with shops for fans, dining, and meeting places. 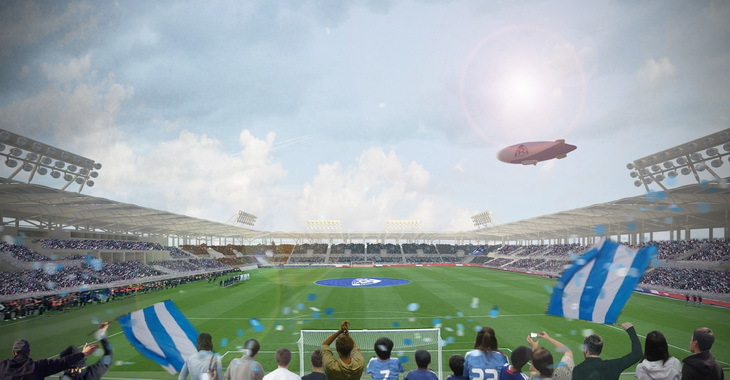 The design idea is based on the concept of making the stadium area accessible 7 days out of 7, not limiting it to the match time or sport events, giving life to a place enjoyed by all citizens. All this is made possible by the creation of a large plaza covered by a roof, which allows fans to to be welcomed repaired and protected from the elements during the sporting event, and at the same time allows citizens to organize events, and to gather in a safe and comfortable place during the week. 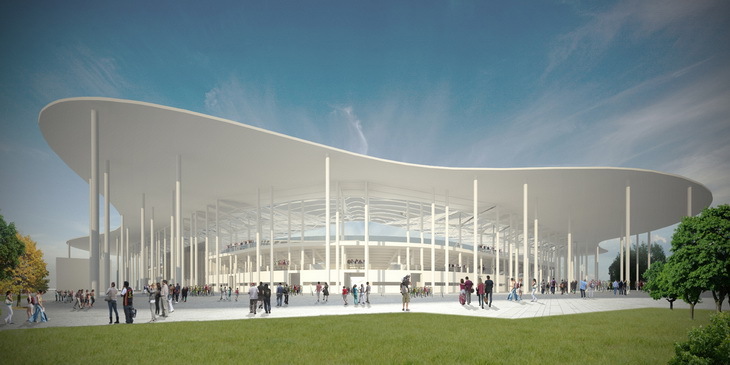 The large roof which is supported by thin steel columns filled with concrete, lies on the project area according to an organic form, which encompasses the area of the stadium, and that laps the car parks to the north and east, thus providing protection to users find themselves protected from bad weather. The roof is made of reinforced concrete, and is entirely painted white, and perfectly smooth on the bottom, while the upper part is characterized by the necessary inclinations useful for the drainage of rainwater, which occurs inside the same pillars. The real advantage of this roof is to make the stadium a building that "blends" between the external environment and internal environment, with the result that the covered plaza truly become part of the sports complex. The main roof is flanked by some smaller and lower roofs, always characterized by an organic form, which allow some areas, such as the tribune of the training camp, the parking lot of the players, to be repaired from bad weather. Overall, the roofs create a dialogue of forms that is not an end in itself, but is designed to make the way of approaching the stadium more comfortable. The project area was organized by thinking to the traffic flow of the fans and workers. Through the West entrance, you have access to a restricted area for players, referees, authorities and press. In this area there are parking spaces reserved for them, and entrances which, due to the use of badges for entry, are speeded up and simplified. Players have access to a car park next to the training field. In this area are also located the parking lots for emergency vehicles such as ambulances, fire brigade, police and so on. Fans of the home team have at their disposal a large parking area of approximately 800 parking spaces, which extends in the northeast of the project area. This car park provides, at the closest point to the large roof, a “kiss and ride” for taxis and bus parking. Fans of the visiting team, will have access from the north west, where there are several parking spaces for buses. Below the roof is located the stadium, whose lower level is composed of a plastered concrete volume, characterized by a long strip window which marks the rhythm of the entrances to the tiers. Above this volume there is a terrace which extends all around the bowl, with the only exception of the west wing, where you find a more compact and “closed” volume, which reaches the roof in height. This volume is characterized covered by thin steel plates, which give a modern and technologic look to the elevation. The tiers are visible from the outside, and are composed of prefabricated “L shaped” elements, supported by pillars and shaped beams. The rear part of the prefabricated elements is deliberately left exposed, so to give a very technical look to the front elevation. 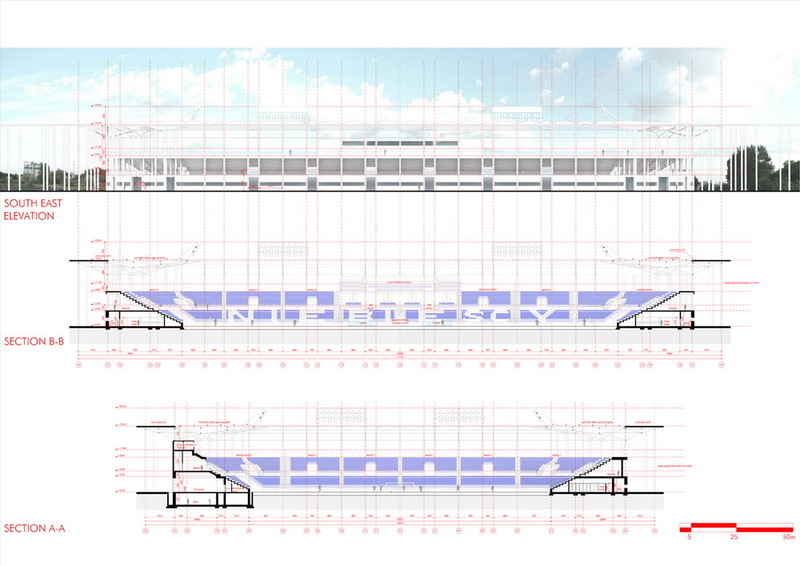 On the upper floor there is a further terrace which has a double utility: an additional overlooking point to the square at the stage where the stadium is configured to 12,000 seats, and a base for additional tiers, consisting steel tubes frames, in the phase of 16,000 seats. The sports complex is provided with its own roof, which is autonomous and independent from the roof covering the plaza. 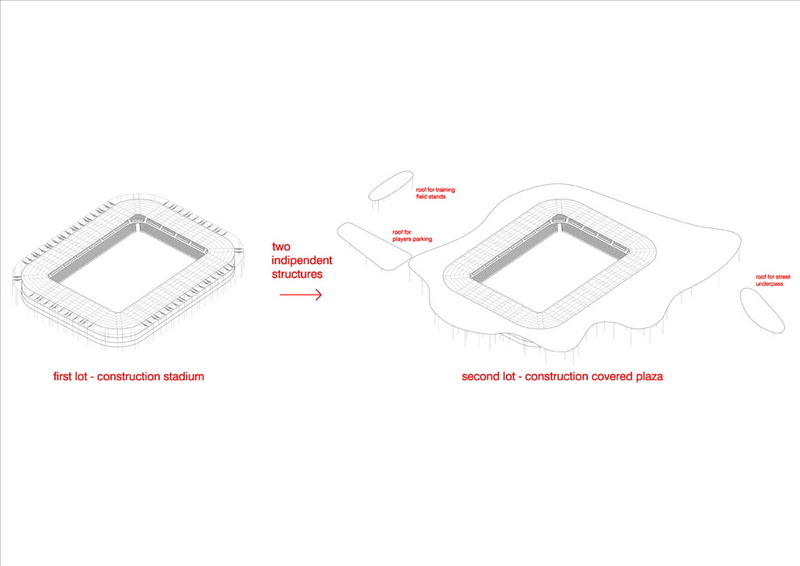 The concrete roof that covers the plaza in fact overlaps the roof of the stadium, and despite collaborates with it, is separate and independent. In this way the client can choose to carry out the construction of the stadium before the construction of the roof of the square. This roof is supported by reticular beams, which, thanks to a panel that hides the reticle, have a modern and sleek design. Among these have been placed thin steel arches, which tend a teflon membrane, white semi-transparent, which allows light to filter on the tiers, and also allows to create a more blurried shadow more on the playing field. 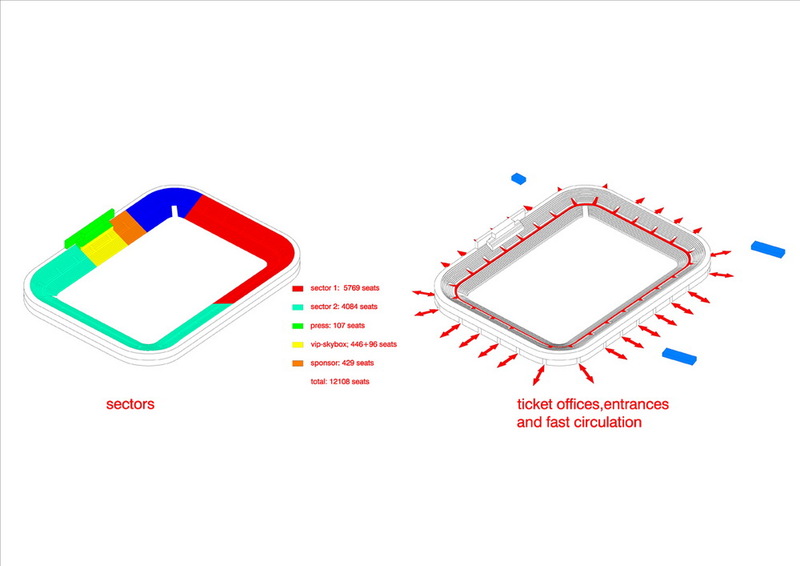 The appearance of the stadium is characterized by a unique identity, which can be perceived, and that interfaces directly to the functionality. By linking these two factors, the project takes an emotional dimension which the public recognizes and aims to become a new symbol of the city. The ticket offices are set within two volumes under the roof. In this way, in all weather conditions, the fans will be repaired and will wait for the development of the queue in the most comfortable way. The access to the sports complex is done through the passage between the turnstiles on the fence of the stadium, equally divided between the different sectors, so as to avoid the formation of long queues for entry. After passing through the turnstiles, the user enters in the sport complex, where there is the possibility to enjoy one the 10 food shops, or to buy something into one of the 4 souvenir corners, as well as is possible to find an adequate number of toilets. All the facilities are situated on ground floor, so as to give life to the access area providing a wide range of different services. The numerous stairs give access to the tiers of the stadium, which are divided by a corridor at an elevation +4.35 m, which corresponds with the arrival of these ladders. This corridor, located in the median area of the grandstand, it is ideal for dividing the fans flow in two directions, the upper one and the lower one, so as to halve the queues to reach the correct seat. 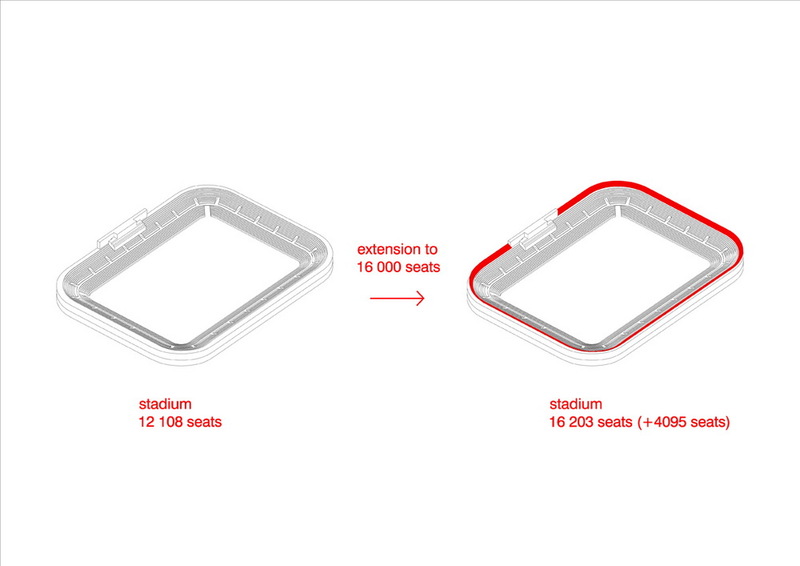 The seats rows needed to achieve the required number of 12,000 spectators, are …….. To reach the 16,000 seats, is expected to add 4 additional rows of seats that can accommodate others ….. seats. The 99 access stairs, are 2.5 meters wide and their size is calculated to allow the evacuation of the stadium in 8 minutes, and is well above the amount of exits required. Some of these stairs are halved in width, and host to a connecting corridor to the terrace that runs all around the perimeter of the stadium. This terrace is a great place to have a break during the intervals of the game, and offers views to the outside, allowing to assist all the events that can be organized in the plaza, from a different and privileged point of view. On this terrace there are also 8 lifts that can be used by spectators and allow to fans with disabilities to reach the seats reserved for them and for their accompanying persons. At a height of +9.65 meters there’s another terrace, which has a double function. in the 12,000 seats configuration becomes another place of overlooking the plaza, but it’s also the base for the additional grandstands that can be mounted in case it is decided to bring the stadium capacity to 16,000 seats. These additional tiers are made of steel trusses, that are very light and fast to assemble. This system allows the mounting without the extension work can disrupt the process of the sports event, ensuring maximum flexibility. The stadium is divided into different sectors, first of all due to a security issue, and secondly to better separate the different organizations of the fans. In the west wing of the stadium are positioned all the VIP spaces and tiers, which includes a large hospitality area with an exclusive bar, a large catering / refreshment area, and a series of spaces useful for standalone operation of this area. These spaces are characterized by opaque glazing to the outside, to ensure the privacy and provide illumination at the same time. From the ground floor there is direct access to the VIP tiers, which include more than 480 seats, 8 skyboxs with 12 seats, each one includes a small kitchen and a private toilet. All these spaces are accessible through a lift usable only by the underlying VIP rooms. The west wing also hosts the rooms reserved for the press, including a pressroom of 120 square meters, a conference room with 50 seats and a fully equipped TV studio, which is connected directly to the playing field, so that athletes, once finished their performance, can immediately be interviewed. The tiers reserved for the press can be accessed by a private elevator, and include 100 seats for journalists, equipped with a desk with computer/tv screen, and internet connection, and 8 boxes for TV / radio commentators. 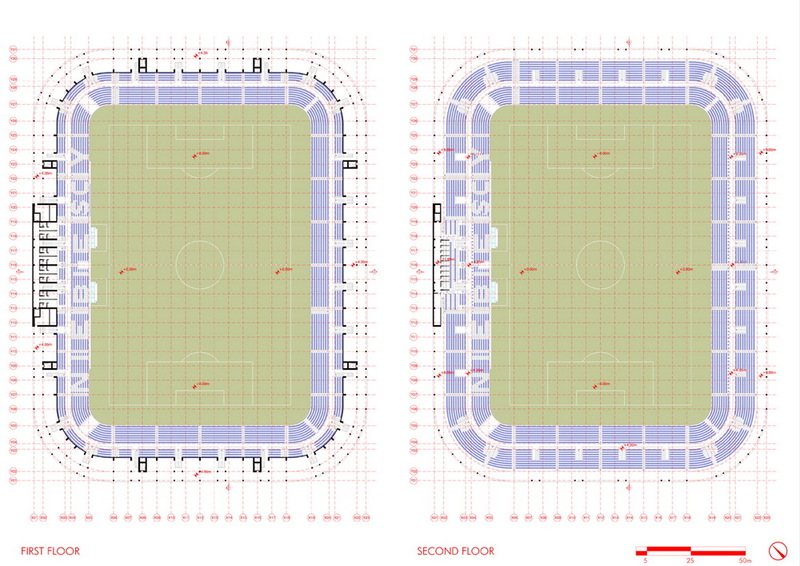 Ruch Chorzow fans will have two sectors. The entrances are placed on the north, east and south side of the stadium. On the ground floor these spaces provide numerous dining areas, and points of sale of gadgets and team merchandise. Both sectors have the opportunity to access to the panoramic terrace, through bridges that connect it to the tiers. Guests supperters will have access from the north-west angle, where, on the ground floor, there are toilets and a food court. Under the East grandstand there are also administrative spaces, which include staff offices, president and vice-president offices, toilets, kitchens, common areas, a large conference room with 50 seats, and a museum , which was deliberately made ​​larger than the competition requests, so that it can become a real symbolic place for a football club with a very important story such as Ruch Chorzow. The other spaces on the ground floor include rooms for police officers, two first aid rooms, and several warehouses, almost all located in the sector of the guests, near the vehicular acces to the football field, so to allow an easy load-unload of goods. Some warehouses are positioned on the underground floor, and are in communication with the loading and unloading area thanks to an elevator which reaches -3.00 mt. As for VIPs and press officers, players and referees have their west side of the building. Referees and players have separate entrances, which lead to -3.00 m by the stairs. The players of the home team will have a dressing room which includes a large gym, a sauna, large spaces warming-up, 2 massage rooms, dressing rooms for coaches and technical staff. The dressing room for the visiting team is also equipped with all the necessary rooms to the staff and athletes. There are also two dressing rooms for the juniores teams. The referees will have a male dressing room and also a female one, as well as a room for massages. Always in the basement are located the doping tests rooms and a fully equipped emergency room. Referees and players have the opportunity to go directly to the playing field through separate staircases. The field measures 105×68 m, and respects all the rules of UEFA, including the provision for the heating of the pitch, which makes it so usable during the colder seasons. Around the soccer field is an area of separation from the grandstands which measures 7.5 meters, that can accommodate workstations for photographers and a double row of billboards for sponsors. The stands are positioned and designed specifically for football. The first row is 1.00 meter higher than the field, and is only 7.5 meters from the bottom line of the pitch. In this way it is guaranteed a perfect visibility of the match. 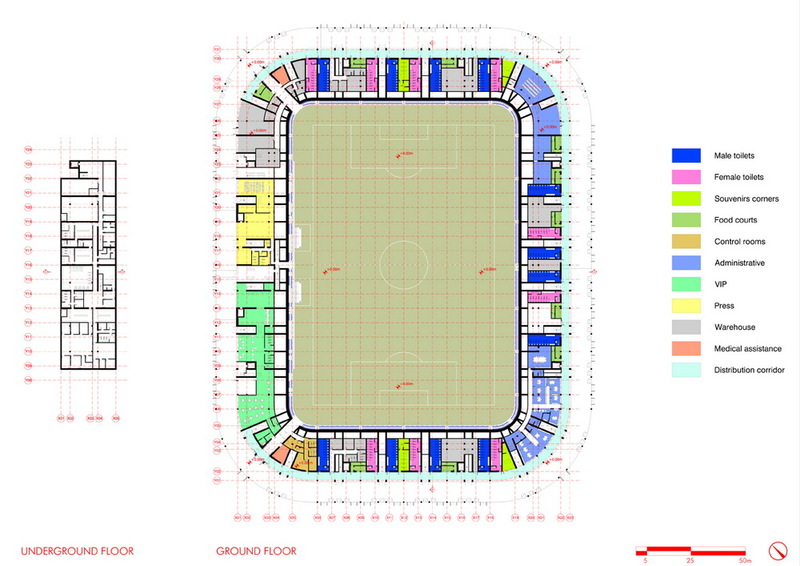 All the seats of the following rows are positioned at heights obtained from perfect visibility curve, which allows the fans to have a total view of the field. The field is accessible to emergency vehicles from the north-west and south-west corners, where there are also placed the first aid rooms and the rooms reserved for safety personnel.